If you are looking for a list of all Upper East Side coop apartment buildings you can find them below. Please note that coops have an intricate application process. If you are interested in purchasing a coop we highly recommend you have a knowledgeable Upper East Side realtor that can walk you through the process. If instead of searching by building you prefer to search by individual apartments click the “for sale” icon in the menu bar. We have a program that will allow you to search all Upper East Side luxury apartments. The beautifully landscaped roof deck of the 12 story building at 340 East 74th Street allows for residents to get fresh air without stepping onto the streets, but if residents do choose to go out they can enjoy the lovely sidewalk landscaping on the tree-lined street. Built in 1957, this 119 unit elevator building brings post-war charm with updated amenities for its residents, including a lovely lobby that was recently renovated. Apartments range in size from large studios to two bedroom two bath apartments. Some of the apartments have been combined and include three bedrooms. Most buyers find value in the Junior 4’s of this building that include dining alcoves off the kitchen. Located mid-block between First and Second Avenue, The Avon House is convenient to a number of well-known restaurants and shops, making it easy to enjoy a night out on the town without having to go very far. For the health conscious, there are ten fitness clubs and day spas within walking distance. When heading out further, cross town buses are easy to catch and the subway at Lexington and 77th is an easy walk. As a co-op, the Avon House has strict policies in place to provide the residents of the building with the highest in standards for the people with whom the building is shared. This means that buyers will need the best in representation in order to apply. A skilled realtor will make this process much easier. To view co-ops homes at 340 East 74th Street, simply call us at (646) 568-7175 or fill out the form on this page and one of our agents will contact you. Often referred to as renown architect Rosario Candela’s greatest creation, 834 Fifth Avenue has a small history of its own, from multimillion dollar deals to family legacies. Laurence Rockefeller spent a lifetime of fifty years living in this building, and when his penthouse came onto the market it broke the New York City record, selling for $44 million to Rupert Murdoch – the most paid for a co-op apartment at that time. Built in 1931, this building is influenced by art deco design, a classic yet vibrant movement in art history that mixed elegance with glamor and functionality with modernity. Twenty five apartments cover the 16 stories of this limestone building, located in Lennox Hill. Each apartment is spacious with high ceilings of at least 11 feet accompanied by vast windows, elegant staircases, galleries and grand libraries. Select apartments feature fireplaces and terraces. The apartment building itself has a 24-hour doorman and elevator attendant; pets are allowed in this co-op and with both Central Park just across the street as well as a courtyard garden within the building itself, it makes it an ideal place for living in the city with furry friends. This building is one of the most sought-after Fifth Avenue apartment buildings. It is a co-op and as a result of this buyers have to get accepted by the buildings board to purchase a unit. It is highly recommended for buyers to work with a skilled realtor that can help them through the application process. To see what apartments are currently available in 834 5th Avenue please fill out the form below or call 646-568-7175 to set up an appointment. Welcome to the childhood home of Jackie Kennedy. 740 Park Avenue has housed more than just style icons, it has been and remains to be the home of some of New York’s most prominent figures. Built in 1930 by Rosario Candela and Arthur Loomis Haron, who helped build the Empire State Building, 740 Park Avenue stands 19 stories tall and is located on the North West corner of 71st and Park. The building is only steps away from Central Park, Madison Avenue shopping and all the Fifth Avenues most relished museums. 31 grand apartments fill this limestone building. However, it’s not enough to call them apartments because they are so much more extravagant than that. While the building itself retains a classic pre-war exterior, the interiors are infused with grandeur that includes private elevator landings, high ceilings, vast amount of gallery space, libraries with wood-burning fireplaces and tremendous dining rooms. Each apartment is spacious and inviting, making it the perfect luxury for the most exclusive New Yorkers. This building is rumored to be one of the most difficult coops to get approved by. To apply for a co-op apartment in a building such as this, it is highly recommended to have a realtor that knows the ins and outs of applying. Call 646.568.7175 to be referred to a realtor that is familiar with this building’s application process. For an instant list of available apartments in this building please fill out the form below. 1120 Park Avenue is an elegant neo-Georgian-style apartment building and is one of the few structures built by George Pelham in 1929. Located in the south portion of Carnegie Hill, 1120 Park is conveniently located close to schools, supermarket, museums, public transportation and Central Park. 70 decadent apartments fill this highly sought-after 20-story co-op building. The interior of the apartments have retained their pre-warm charm which includes wood-paneled rooms, beautifully carved fireplaces, and beamed ceilings. Many of the apartments on the penthouse floors have large terraces with spectacular views of the city skyline and the park. A full time doorman and concierge are always present in the building’s lobby to great you and to take your packages. There is also a gym within the building. Carnegie Hill is one of the Upper East Sides most desired residential areas. Many of the co-op boards in this area may be difficult to pass but with the right realtor, the application process can become easier, especially for first-time buyers. 1120 Park Avenue is considered by some to be one of Park Avenues most prestigious co-op apartment buildings and it’s highly recommended you use a buyers-broker when purchasing in this building. If you’re interested in viewing apartments in 1120 Park, please call Upper East Side Apartments at 646-568-7175 to speak with an experienced agent. For an instant list of available apartments in this building please fill out the form below. If one word comes to mind when looking at 1185 Park it’s “Grand”. One of the last of its kind, this Gothic-style perfect-square building takes up almost an entire block and boasts a large interior courtyard/driveway in it’s hallow center. This court leads to multiple lobbies with six elevators servicing two apartments on each floor. The building was built in 1928 and has some of Park Avenues largest apartments. Many of the 165 units in 1185 Park have been renovated throughout the years, but they are all characterized by large foyers, lofty living rooms and innovative layouts. These apartments are spacious and classic, staying true to their original aesthetic design. The handsome limestone and brick building stands 15 stories tall and features a gym. It is rumored that residents rarely use the treadmills in the gym as they conveniently have the running path along the reservoir in Central Park two blocks away. West of the building residents are also one block away from some of Madison Avenues most relished restaurants including Sarabeths, Jackson Hole and Pescalou. Not to mention a list of schools including Hunter College, Spence, and Nightingale-Bamford. East of the building residents can find bus services going uptown and downtown, the 6 train on Lexington Avenue and a bunch of convenience stores along Lexington and Third Avenue. While this building is a co-op, an extensive application process awaits any interested buyers. When applying for an apartment in a co-op building, it is recommended prospective buyers work with a specialized realtor that will be able to assist them with not only negotiating a good price but with presenting their application in the best light. If you are interested in viewing available apartments in 1185 Park Avenue, please contact Upper East Side Apartments by calling (646) 568 7175. 1040 Fifth Avenue is a prized Upper East Side apartment building, once home to Jackie Kennedy. Fifth Avenues finest architect, Rosario Candela, designed this structure in 1925 as one of the tallest on Fifth at the time. The building has an elegant limestone-clad façade and stands 17 stories high with 27 spacious apartments. The floor plans for 1040 Fifth are characterized by vast galleries as you enter the apartments, followed by living rooms spanning over 30 feet with unbelievable views of Central Park and the reservoir, eat-in kitchens, formal dining rooms, multiple maids rooms, libraries with decorative fireplaces, 3-6 bedrooms, and terraces on higher floor apartments. 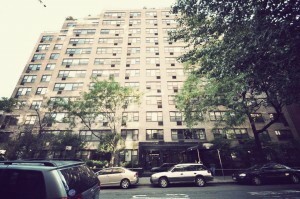 The building is located between 86th and 87th street and faces Central Park. This prime location is near museums, schools, transportation and shopping. 1040 5th Avenue has retained its classic style throughout the years since its construction. New Yorkers recognize this building as an iconic one for its handsome facade and ideal location. The building is a co-op, meaning it is required to apply through a board if you are interested in purchasing an apartment in this building. To view residences in 1040 Fifth Avenue along with other Upper East Side luxury apartments, please call 646-568-7175 to speak with a specialist.